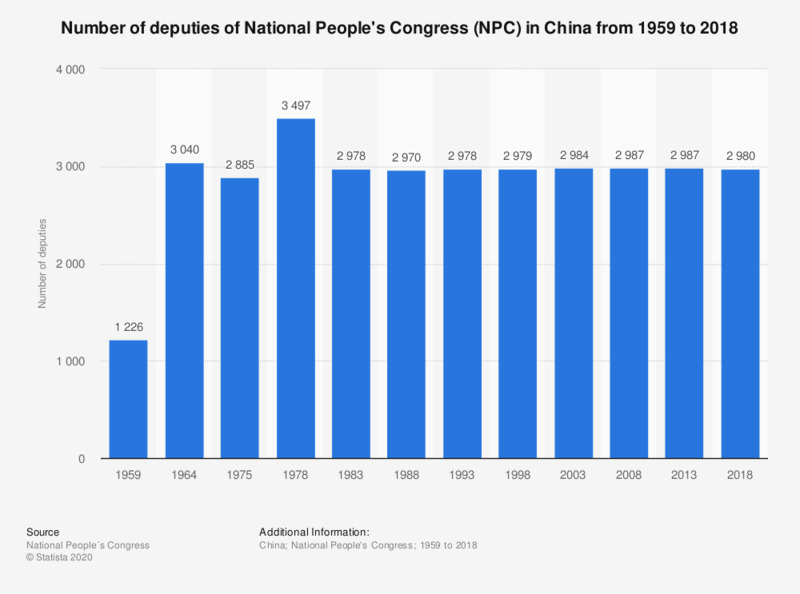 This statistic shows the number of deputies of National People's Congress (NPC) in China from 1959 to 2018. In 2018, 2,980 deputies were elected for the National People's Congress in China. The National Party Congress is the Chinese Communist Party's organ of supreme power. The delegates are elected once every five years by the Central Committee. According to the Chinese government's official webseite the functions are "to hear and examine the report of the Central Committee, to hear and examine the report of the Central Commission for Discipline Inspection, to discuss and decide on major issues of the Party, to revise the Party constitution and to elect the Central Committee and the Central Commission for Discipline Inspection". The data on former National People's Congresses was taken from China Statistical Yearbook 2012, page 925. Everything On "Chinese Communist Party CCP" in One Document: Edited and Divided into Handy Chapters. Including Detailed References. Statistics on "Chinese Communist Party CCP"
There has been much talk in these days about the electoral law. Do you feel informed about the matter? How much do you appreciate the conduct of the mayor of Turin Chiara Appendino? Political parties are discussing about the minimum threshold to adopt. Which one would you prefer? Please tell me how much you agree or disagree with the following statements? What difference, if at all, do you think laws protecting Human Rights make to your life?